Preheat oven to 350°F Line a 9x13 inch metal pan with nonstick foil. For a half batch, use an 8 inch square metal pan. In a small saucepan or microwave-safe bowl, melt the butter. Pour the hot butter into a large mixing bowl and add the brown sugar. Stir well and let cool slightly to that the brown sugar melts a little bit. Whisk in the vanilla, molasses, room temperature eggs, and peanut butter. 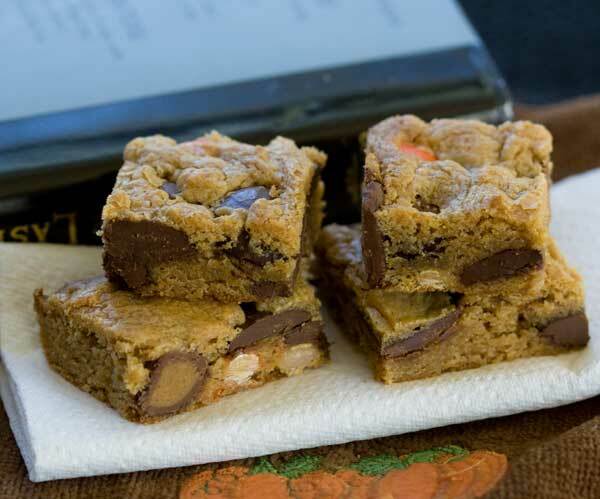 Add the baking powder and salt and whisk until blended, then gently whisk in the flour.Stir in melting chips, Reese’s Minis and Reese's Pieces (if using). -- For a half batch, use half the ingredients and bake in an 8 inch square pan. -- If eggs are room temperature, you won't have to beat (whisk) them quite as hard to mix them with the other ingredients and will probably end up whisking less air into the batter. In my experience, whisking or stirring ingredients rather than beating them usually makes a denser, less cakey, bar. these are not cakey at all.